Sara Bibik waited years for her blue cart. In February 2014, Chicago finished rolling out the curbside or alleyway recycling containers to every small residential building in the city, fulfilling a promise first made seven years earlier. “We were one of the last wards to get blue bins, so we had Blue Bags for a long time,” says Bibik, referring to the city’s previous, unsuccessful recycling program. The city’s Blue Bag system was notoriously expensive and ineffective, and after 13 years of trying to launch a citywide recycling campaign, Chicago ditched the program. Despite the distrust many had for Chicago’s blue bags, Bibik and her family had kept using them. “You felt like it was working. We still did it,” she said. 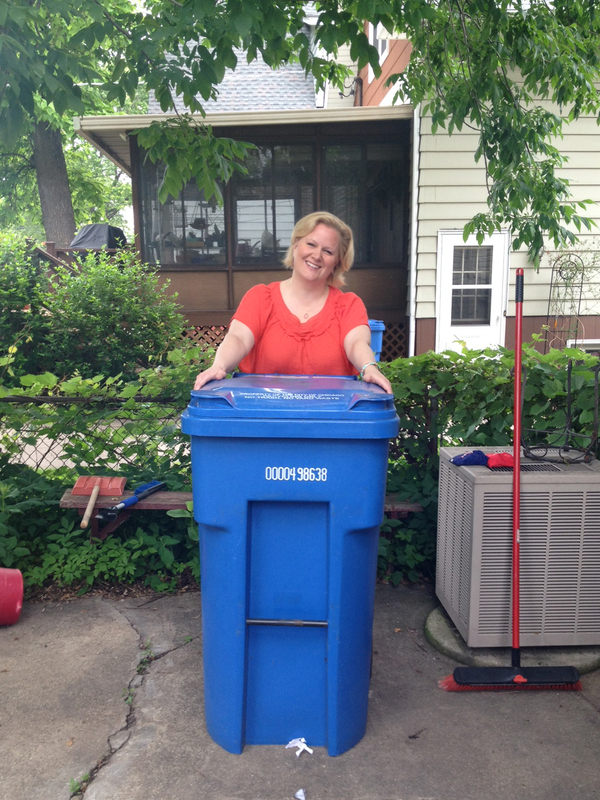 She’s glad to have a blue cart now, but fears all her work recycling might be for nothing. I want to know if our city’s blue bin recycling actually gets recycled. But, she asks, is it all going to the landfill anyway? Is recycling all a sham? To answer her question we’re going to follow the trash from Chicago alleyways all the way through the elaborate sorting facilities where recycled stuff gets prepped for its second act. We’ll find out how much of that stuff gets thrown out by the many hands that handle it along the way. And we’ll learn how recycling connects average recyclers like Bibik to bauxite miners on the other side of the planet. When it comes to recyclables ending up in the landfill, things are a lot less bleak than Bibik secretly suspects — recycling in Chicago is not a sham — but there are reasons to wonder if the city underestimates how much of its “recycled” products actually end up as garbage. Not everything makes it out of the alleyway. If garbagemen open the lid of a blue recycling bin and see trash, they slap an orange sticker on that cart, flagging it for the next garbage truck. The city then sends a letter to the bin’s owner. “We have good parts of city and bad parts of the city,” says Baran. Baran sees clunkier contaminants, too: soccer balls, garden hoses, yard waste. Workers will sometimes remove any obvious items from the top of a blue cart and dump the rest onto the truck to be recycled. Otherwise, they leave the load with an orange sticker. Last year 27,199 households got at least one of those stickers, or about 4.5 percent of blue cart users. About 1 percent of blue cart homes continued to mistakenly (or purposefully) recycle garbage, and ended up with three or more stickers by the end of 2014. Chicagoans sent off almost 103,845 tons of stuff into their blue carts last year, and about eight times as much into their black garbage bins. That’s an all-time high, and about 90,600 tons more than in 2007, the program’s launch year. 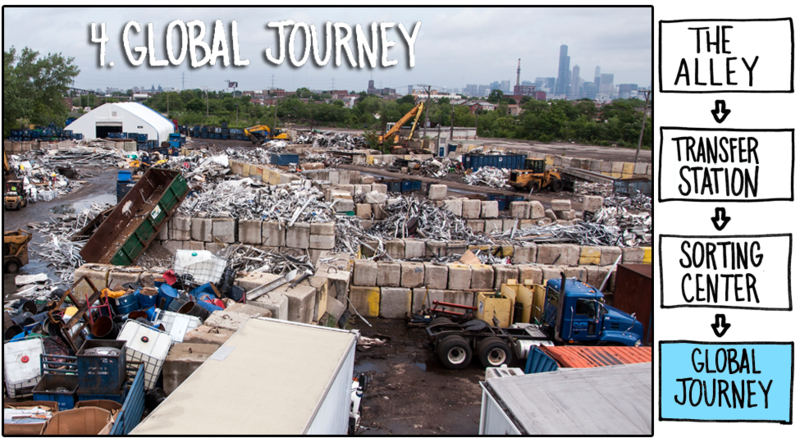 When their truck is full, Baran and his colleagues drive to one of the city’s transfer stations, preparing Chicago’s trash for its potentially global odyssey. Seagulls cruise over two house-sized mounds of refuse in an empty warehouse. If it’s carrying garbage, Baran’s truck will dump its contents into a pile on the east side of the room, or in the western pile if it’s carrying recycled material. First he’ll have his truck weighed. “There&apos;s not much that occurs in terms of any sort of processing here — it&apos;s like materials dumped out on the floor and it’s hauled out of here to some other location,” says Chris Sauve, recycling director for the city’s Department of Streets & Sanitation. At this point, almost everything from Chicago’s blue bins is still destined for recycling, except for whatever’s left in the alley with orange contamination stickers. Almost two-thirds of Chicago’s blue cart recycling is paper, however, and if it’s soaked with enough rainwater the whole load has to be landfilled. Sauve says this is so rare that they don’t keep numbers on it. Under five-year contracts that go through 2018, Waste Management and Resource Management agree to buy Chicago’s goods at a price that the city adjusts every quarter based on global commodity markets. To account for the costs associated with buying the city’s trash, such as hauling and dealing with contamination, Waste Management and Resource Management get to buy at a slight discount, in a sense — in fact, Resource Management essentially gets paid to take the city’s glass. Since all the recycling is mixed together in what’s called a “single-stream” program, the city multiplies the quarterly price of each commodity by its proportion in Chicago’s waste stream, based on the city&apos;s 2009 waste characterization study. As mentioned, paper and cardboard make up 68 percent of the average ton of blue cart material by weight. Glass is about 11 percent, plastic 4 percent, and metal 3.2 percent. 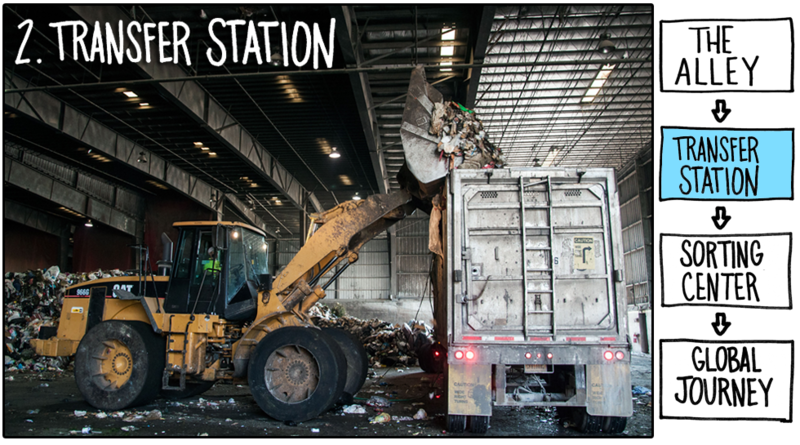 After they send trucks to scoop up recyclables from the giant piles at transfer stations, Waste Management and Resource Management send them through an elaborate industrial process to separate out the goods by material. I visit one of these sorting facilities, operated by Waste Management, on the far Southeast Side of the city. It’s just on the other side of highway from Beaubien Forest Preserve. There I meet Mike Tunney, Waste Management’s area director of recycling. 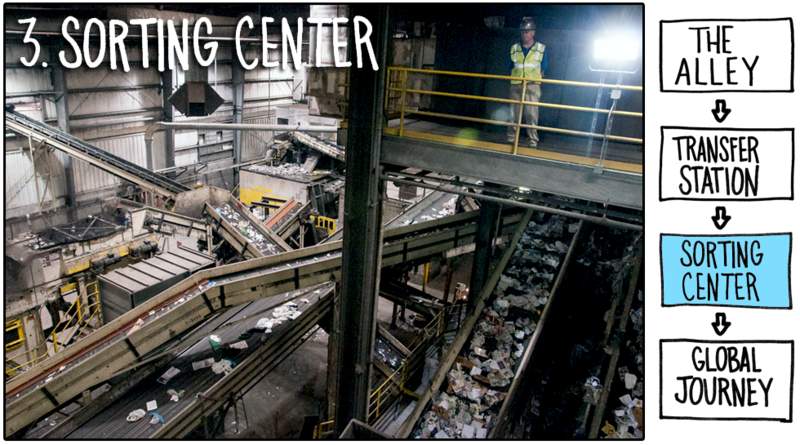 Between this and their other Chicago-area facility, Waste Management processes approximately 24,000 tons of recycling every month (only about 5,000 tons comes from the blue cart program). About 600 hundred tons of recycled material pile up here each working day, Tunney says — a fact that’s evident from the ceiling-high mountains of trash and heavy truck traffic. To get it ready for its customers, Waste Management sends the mixed-up waste through a labyrinth of conveyor belts, high-tech machines, and actual people who “manually recover” certain items as they roll by with the rest of the trash. Humans also sift through paper goods on conveyor belts in the facility’s “fiber sorting room,” and perform quality control at several other points. But most of the work is automated. Giant blowers waft paper over a sieve for heavier materials like metal. A row of spinning wheels bounces plastic containers along — as long as plastic bags and food waste haven’t gummed up the gears. Sorting through trash is surprisingly high-tech. Several types of electromagnetic filters — fiber magnets, eddy currents — recover more valuables. There’s even an optical sorter that discerns different types of plastic using a laser. But what about the stuff that doesn’t make it past this step? Tunney says 18 to 20 percent of what goes into their facility doesn’t make it out because they can’t recycle it. It’s “contamination” like we see with the orange stickers in the alley. 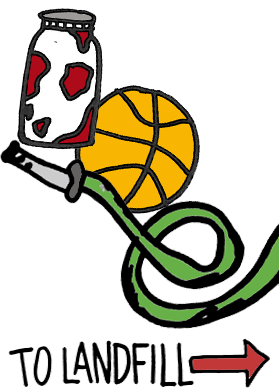 A few examples are laid out on the factory floor: a basketball, a garden hose, even a Listerine bottle full of hypodermic needles. I see dozens of plastic bags stretched and wrapped around gears in a dormant machine — garbage, and a costly hassle for Waste Management. Paper that’s too wet won’t make the cut, and neither will anything too caked with food waste. The needles go to biohazard disposal. The rest? It all ends up in a landfill. The 2009 waste characterization study is also where the city gets its estimate of contamination in the waste stream, or how much of the blue cart material Waste Management and Resource Management will have to eventually throw out because it can’t be recycled. According to the city, that number is 13.8 percent, or about 14,330 tons in 2014. Resource Management and Waste Management say that number, which was based on 2007 data, is actually much higher now. Greg Maxwell, senior vice president at Resource Management, said it can be as high as 30 percent. Waste Management’s Mike Tunney quoted their contamination rate at 18 to 20 percent. If those numbers are correct, the city’s Department of Streets & Sanitation could be underestimating the amount of “recycled” blue cart material that ultimately ends up in a landfill by 4,361 to 16,822 tons. Coca-Cola or Anheuser-Busch might buy bales of old aluminum cans to cut the raw material costs of making new cans from scratch. International Paper might buy up recycled paper. Or local companies like Pure Metal Recycling might buy bales of bulk metal, segregate the materials by chemical purity, and sell those new bales to smelters and steel mills. Kyle Witter shows me around Pure Metal Recycling’s scrap yard in the McKinley Park neighborhood. They sift through all types of metal waste — curly shavings of aluminum, empty beer cans, I even glimpse a piece of an old CTA bus — and send it to manufacturers. They say all their steel ends up at steel mills within 200 miles of the city. There, it’s melted down and made into everything from steel tubes to components for power tools. But only a small portion of this material starts in your blue carts or curbside bins — less than 2 percent, according to chief administrative officer Dennis Schalliol. Most of what I see is car parts, the innards of thousands of automobiles. By some measures automobile recycling rakes in $22 billion annually. Forklifts stack cubes of compressed aluminum two stories high. Witter points out a row of aluminum 6111 alloy cubes, which Ford will buy to use in its all-aluminum body Ford F-150 pickup trucks. I do see daunting mounds of aluminum cans that likely started in the blue carts of people like our question asker Sara Bibik. But according to Adam Minter, who wrote a book about the global recycling trade called Junkyard Planet, commercial and industrial recycling operations dwarf municipal programs like Chicago’s blue cart. “We all as Americans think of recycling as putting something in the blue bin. But the blue bin only represents somewhere in the range of 5 to 15 percent of what&apos;s recycled in the United States,” Minter says. “It&apos;s a very very small piece of the pie. And it&apos;s a very expensive piece of the pie." Someone has to be making money after all this, right? How’s the market treating Chris Sauve, the city’s recycling director? That might be par for the course. Like a lot of cities, Chicago got into a low-margin business when commodity prices were up. In 2007, when the city’s blue cart program got started, commodities markets were soaring through what’s called a “supercycle,” and arguably into a bubble. According to author and journalist Adam Minter that market is cyclical. “There&apos;s really nothing unusual. It&apos;s just that your municipality, Chicago, has gotten involved in the commodity business, and commodities go up and they go down. You&apos;ve gotta ride it out,” Minter says. The thing is, recycling is not an easy business — especially for a municipality compelled to provide it as a public service. But it may not be as bad questioner Sara Bibik fears. Remember, she wonders if recycling in Chicago was just a feel-good sham. Sara Bibik might not have realized her recycling was feeding into this giant, global trade, or that for the last several years that that business has ebbed and flowed largely with demand from manufacturers in China. But she’s just happy to know it’s getting recycled at all. Even if at least 20 percent of it is “contaminated” and ends up in the landfill anyway. Sara Bibik grew up in Manitowoc, Wisconsin, but moved to Chicago when she was 18. For the last 15 years she’s been raising two kids with her husband, Jeff, in the Edison Park neighborhood. And she’s been teaching those kids, 14-year-old Zoe and 11-year-old Jake, how to recycle. “We just had a party, so there were some soda cans in the trash and the kids are all like, ‘Oh! They should be in the recycling!’” says Bibik, 47. 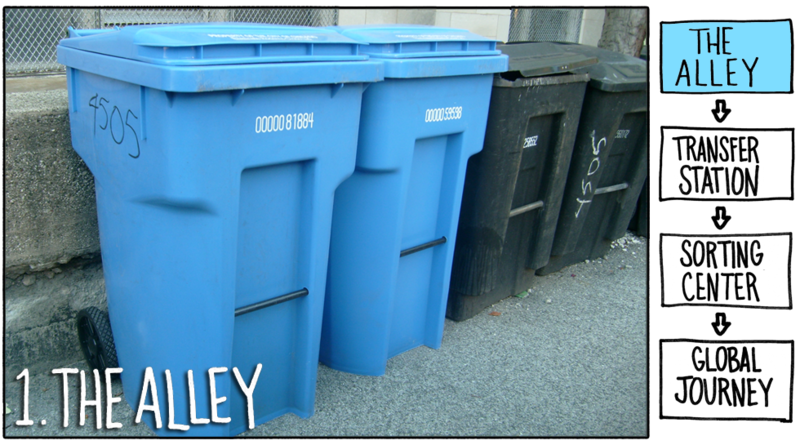 The family started recycling when the city began offering Blue Bags in 1995 and kept up with it until the program was discontinued in 2008. Between the Blue Bag and the blue cart programs, Bibik even took her recycling to a dropoff center in a nearby forest preserve rather than throw it out. Bibik says she waited years for a blue cart, and now that she has one she wants to know more about what actually happens to all the stuff her family dutifully throws in there. Chris Bentley is a freelance journalist who reports regularly for WBEZ’s Curious City. Follow him atcabentley.com and on Twitter at @Cementley.